Want to video call someone from your computer but don’t have a Webcam? No problems, DroidCam is a freeware utility that lets you convert your Android device into a web camera for your Windows computer. DroidCam is very useful though simple to use. You need to install the DroidCam onto your Android device as well. Wi-Fi Mode: Under this mode you can wirelessly connect your mobile phone with the computer and use it as a webcam. This mode is always recommended as it is easiest to setup. You just need to copy the details as it is from phone and enter them on the PC Client. In this mode your mobile phone acts as a Server and your PC as a Client. USB Mode: As the name suggests, this mode lets you use turn your phone into a Web Camera on a USB Connection. This mode is recommended only if you don’t have a Wi-Fi router installed. Some times this type of connection may require advanced configuration due to missing of some drivers. Wi-Fi Server: This mode is only compatible with the paid version of the mobile app, in this mode your computer acts as a server and the mobile as a client. The mode can run under 3G/LTE so that you can connect to an external IP and share your mobile’s camera to a PC from wherever you are. Bluetooth Server: This mode is similar to the previous one, you must have the paid version of mobile app to use the mode. Once you’ve successfully established a connection between your phone and your Windows PC you are ready to go. You can use the DroidCam to video chat with your friends using Skype or any other video calling software. Remember that the ‘Metro’ version of the Skype is not supported but you can download Skype for Windows to use DroidCam with Skype. The software is unique in its kind and performs a very uncommon task of converting a phone into a webcam. Nowadays Android phones comes with a camera no less than 5 MP so you can enjoy a quality even better than an average webcam. 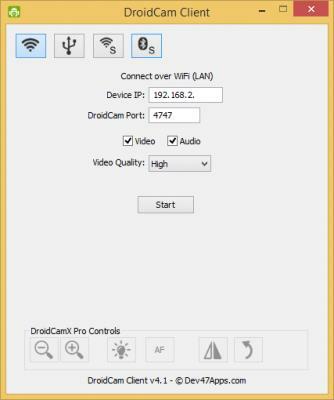 DroidCam is very simple to use and operate, no advanced configurations are required except in the USB case if the drivers are missing. Click here to download DroidCam client form Windows. You can download the app for your mobile from here.